For drivers here in Orlando, settling for a runner up in the world of trucks simply isn't an option. Letting this lead the way, Nissan's Titan was built to own work in ways the competition can only dream of. Take a moment to follow along with the Universal Nissan team and you will soon see that the Titan is all business when it comes to making good on this declaration. Getting the job done right has never been easier thanks to the Titan's muscular powertrain. 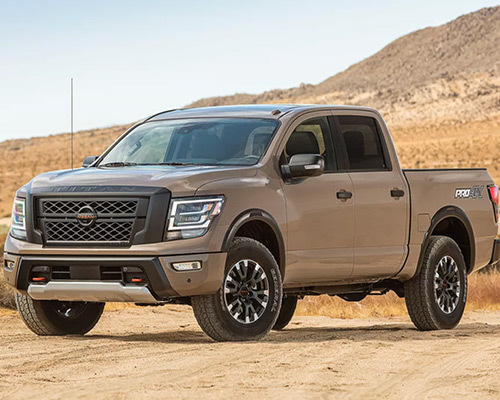 Specifically, owning or leasing a Nissan Titan from Universal Nissan gives you access to a powerful 5.6-liter (L) Endurance V8, capable of generating 390 horsepower (hp) and 394 pound-feet (lb-ft.) of torque. If taking care of business is your prime objective, can you really afford to settle for less? Outside of packing a ton of heat under the hood, the Titan also knows a thing or two about pulling the heaviest of loads. At the end of the day, you can enjoy the ability to tow up to 9,660 pounds (lbs.) when you park a Nissan Titan in your front driveway. If counting on your truck to handle any payload is a must, then it is obvious that the Titan needs to be on your radar. Need to cart off a load of rock or sand to the job site? Then you can count on the abuse-ready Titan truck bed to help you tackle this tough task. Engineered to haul up to 1,610 lbs. of payload, our selection of Titans currently offered up for sale or lease in Orlando are more than prepared to accommodate gravel, dirt bikes, and anything else you can think of to throw in the back. Slogging through your daily grind can be fun again with the power of the Nissan Titan S on your side. Thanks to its Push-Button Ignition, Hands-Free Text Messaging Assistant, 40/20/40-split bench front seat, and countless other premium additions, cruising down the streets of Orlando has never been more enjoyable. 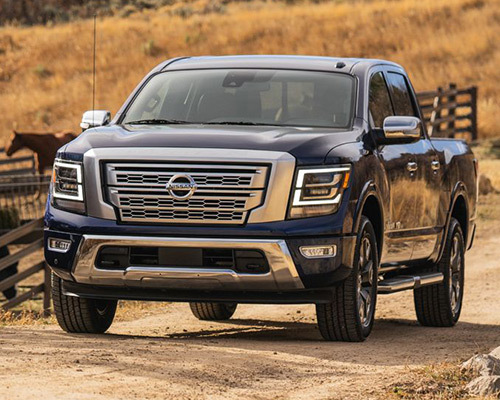 Building on the foundation laid by the S, the Nissan Titan SV is a premium option for pickup owners who demand more from their truck. In an effort to become the most enticing driving experience in all of Orlando, this pickup leverages tons of impressive updates, including interior mood lighting, chrome exterior, and even grocery hooks located on the bottom of the rear seat cushion. 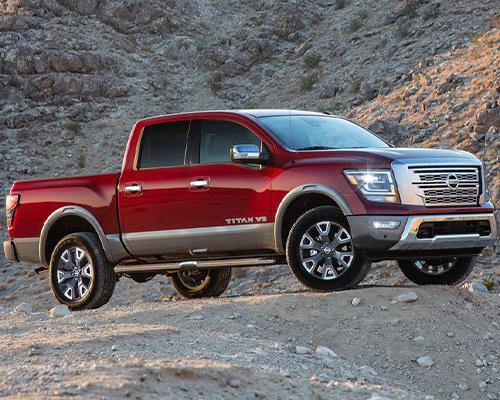 The Nissan Titan Pro-4X has all the tools needed to help you conquer any trail. Naturally, backing up this bold declaration is a breeze when you have access to Bilstein Off-Road Performance Shocks, 18-inch (in.) all-terrain tires, an Electronic Locking Rear Differential, and countless other upgrades designed exclusively for the off-road. The Titan is a truck that knows how to satiate your modern tech needs. Going a bit deeper, leveraging Android Auto and Apple CarPlay ensures that tapping into the digital world while you are on the go is a cinch. From making calls while keeping your eyes on the road to leveraging the Google Assistant to get directions to your next appointment, anything is possible with these two digital powerhouses on your side. Just because the Nissan Titan is one tough truck, that does not mean that you need to be unnecessarily tough on your gear. This is where the Titan Box system comes into play. Modular and designed to keep your gear secure no matter where the roads take you, Titan Boxes serve as the ideal capstone one a new Nissan Titan. Need options when it comes to truck bed configurations? Then the Titan is ready to meet - and exceed - your needs. With access to a 5.5-foot (ft.) bed on crew cabs, a 6.5-ft. option on king cabs, and a massive eight-ft. choice for single cab editions, there is no denying that you can build the bed of your next Titan just the way you like. After showcasing all of this and bringing you up to speed on all that the Titan has to offer, you only have one question left to consider: Don't you deserve all of the power, comfort, and safety that comes with driving home in a new Titan of your own from Universal Nissan?